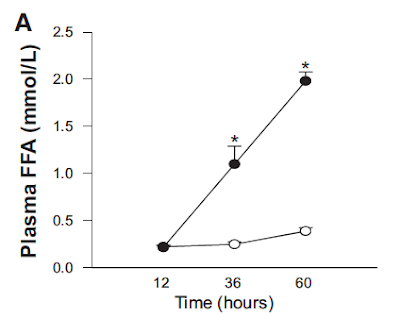 Here's a paradox: How can two groups of mice, on exactly the same chow, have different 24h averaged RQs, p less than 0.05? It's from here if anyone wants to peek at the methods. Two sets of animals on the same chow. It's 9F 5020, 21% of calories from fat (7% of calories from PUFA) and 55% from carbohydrate. 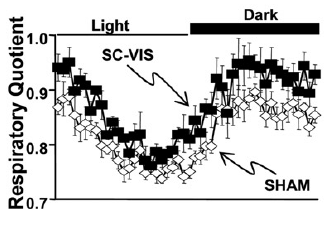 At all time points the SC-VIS mice have an higher RQ, ie are oxidising more glucose, than the SHAM mice. But they are all fed the same chow, which should average out at the same overall RQ. Clearly you can increase the RQ, even above 1.0, during de novo lipogenesis, especially when hungry mice suddenly eat carbohydrate. But there is either a payback during the sleep phase where RQ falls below the food derived RQ while that carbohydrate-derived fat is oxidised or there can be no fall in that fasting RQ if the DNL generated fat is "lost" in to adipocytes and stays there, ie under weight gain. Of course simply sequestering dietary fat in to adipocytes will generate an RQ more typical of glucose oxidation because less fat is being oxidised, full stop, during weight gain. During on-going fat loss the extra low RQ from adipose derived fat oxidation does not have to be payed back either. "Food" of very low RQ, has been supplied from adipocytes. It's gone out of the body as CO2 and water. 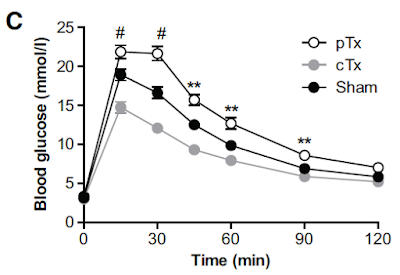 But the black square mice are weight stable or actually losing adipose weight (ie should have an extra low RQ) at the time these RQs were measured, while the open diamond mice are actively gaining weight (including adipose tissue), so should have that higher RQ. Food intakes are describes as "no significant difference" between the groups, despite the differential weight shifts. To me this is inexplicable and should have been discussed in the paper. My feeling is the CLAMS equipment is generating a totally illogical result. Unless I've totally missed something. I would really like to know whether I have totally missed something. Wooo has posted a couple of times about Dr Shawn Baker who eats an all meat, very high protein diet, maybe over 400g/d protein intake. His HbA1c is reported as 6.3%. Personally I have absolutely no interest in this style of eating but the underlying mechanism is obviously interesting. A person eats a lot of meat. In response to the insulinogenic amino acids present they secrete insulin. This will be amino acid specific, I’ve not looked in to how amino acids trigger insulin secretion in detail but it will NOT be through pancreatic glucokinase and subsequent glucose metabolism, as is the case for glucose triggered insulin secretion. So they secrete post prandial insulin but not using glucokinase. The insulin will be exactly in balance with the glucagon for that specific protein meal. The expression of the gene for generating pancreatic glucokinase is controlled by the carbohydrate content of the diet. Glucose means glucokinase is required. All amino acid diet, no glucose, down-regulate glucokinase. 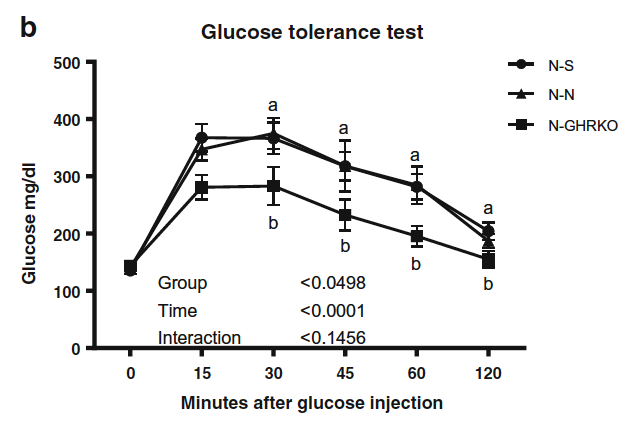 So, as glucose is subsequently and gradually produced from gluconeogenic amino acids and then released from the liver over several hours (in the presence of only basal insulin), there is only a mild glucose derived stimulus to trigger insulin secretion, and this slow release of glucose by the liver also provides only a minimal drive to express the gene for pancreatic glucokinase. Also hepatic glucose output shouldn’t trigger any of the gut derived insulin secretion potentiating hormones (GLP-1 and the like). So pancreatic glucokinase is mothballed. Modest glucose release from protein metabolism won’t trigger insulin secretion without the glucose sensor. End result is low insulin with moderately elevated glucose, especially during the time protein is being processed. Which I'd guess is pretty well all of the time on greater than 300g/d. How high should glucose go? High enough to allow a slow trickle to be taken up by constitutive transporters and so deal with hepatic glucose output in this way, without insulin facilitated augmentation. Facilitated by exercise if you like that sort of thing. How toxic is glucose in the absence of hyperinsulinaemia, given that HbA1c over 6%? Dr Baker will let us know over the next 15 years! Of course exactly the same happens on LCHF eating, just fat does not provoke chronic glucose release from its metabolism outside of a little glycerol derived gluconeogenesis… It probably happens too in some of the weird sucrose based weight loss diets where the mice (it's mostly mice but we all know that you can do "carbosis" in humans too) are hypoinsulinaemic (otherwise they would be fat!) but glucose intolerant. A diet based on a non-insulinogenic sugar (fructose) and its palmitate derivative will mothball pancreatic glucokinase too. I'm going to use some of Konrad's data to try and understand Kahn's data and the see if it will extrapolate to growth hormone receptor knockout (GHrKO) adipoctes. That's the plan. Time will tell... I'm going to use the term eWAT for epididymal adipose tissue. There are three curves here from Konrad. The open circles are mice with extra eWAT carefully added to a mesenteric (liver draining) site only. The eWAT is inflamed, leaking IL-6 and this goes directly to the liver. This IL-6 is causing hepatic insulin resistance with glucose intolerance, as per the last post. There is no elevation of portal FFAs after a three hour fast (not surprising when you recall that you need seriously low insulin levels to access visceral fat, three hours won't hack it). So we can ignore the open circles. The black circles are the controls. The grey circles are mice with eWAT (this is normal eWAT from normal sacrificed Bl/6 mice) added to the peritoneum with all of its venous drainage going to the systemic circulation. This too is leaking IL-6 but by the time it's diluted throughout the whole systemic circulation it causes no insulin resistance. Result: adding eWAT without hitting the liver with IL-6 simply provides extra adipocytes, they accept glucose, glucose tolerance test results improve. This is a generic effect of adding extra adipose tissue, it doesn't seem to matter what the source of adipose tissue is or where you put it, so long as it isn't trickling IL-6 in to the liver, any extra fat improves glucose tolerance. Think thiazolidines, more new fat cells, they're empty, glucose tolerance improves as the cells fill up. This is the exact converse of the diabetes of lipodystrophy cases: in lipodydtrophy there is no adipose anywhere, nowhere to put glucose/fatty acids, all stored triglyceride is ectopic, so your end result is severe glucose intolerance. Now, you have to be very careful with this data. Basal lipolysis is not the same as lipolysis under fasting levels of insulin. Basal lipolysis would produce a ketoacidotic fatality because no insulin is obviously the equivalent of severe T1DM and is rapidly fatal without a very expensive trip to A and E (unless you have the NHS). 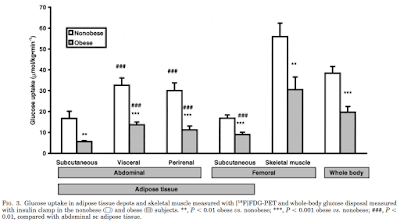 Next we have the problem that this lipolysis measurement is made per gram of tissue, but in the whole animal some tissue depots are bigger than others as a % of bodyweight and all GHrKO mice are obese, so they have much more fat to provide FFAs per unit muscle etc. The approximate total fat mass of a GHrKO dwarf mouse is actually very similar to that of a normal Bl/6 mouse, it's only the fat free mass which is small. 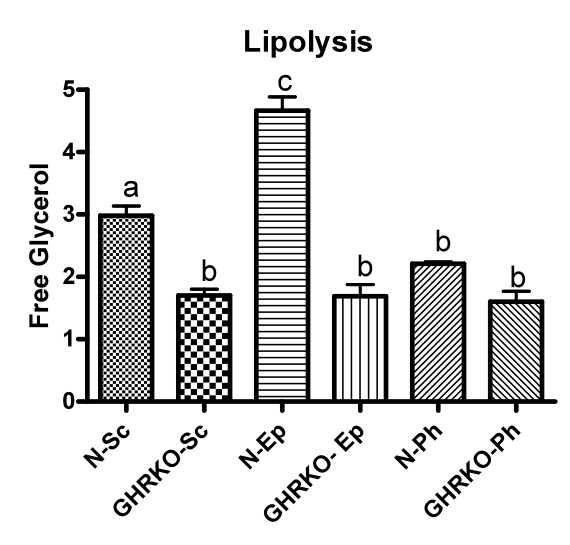 So glycerol release per gram of adipose tissue may be lower in the dwarf mice, but total lipolysis might be very similar to Bl/6 mice. Merely adding basal insulin would produce a normal, hungry mouse but we have no idea what the rates of lipolysis would be then and if they might change more in some tissues than others. So a little caution, to say the least, is needed. With that said I was going to go on to say all sorts of things about lipolysis but at this point the penny dropped, as we say in the UK. I've stopped following the trail and I think I know why GHrKO mice are the longest living mice ever engineered. Perhaps I should put that in to a final post in the series. 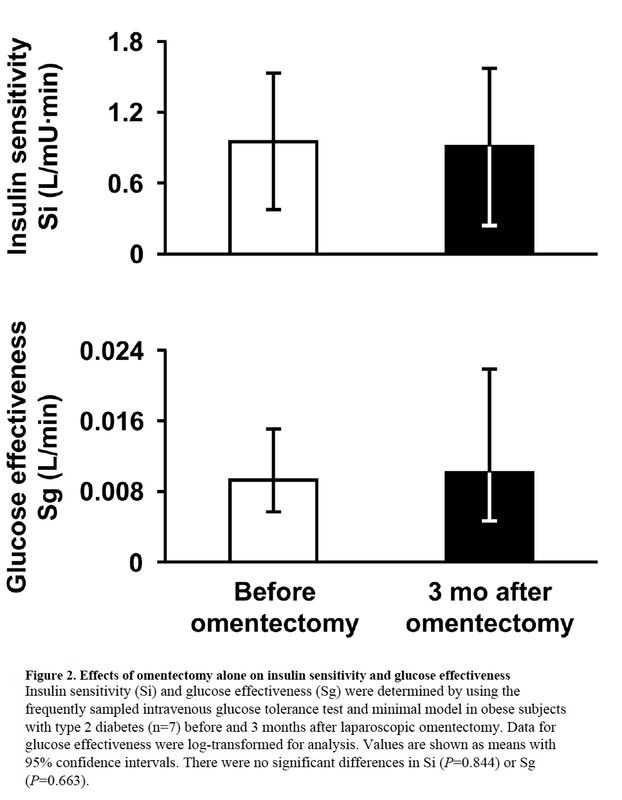 Even transplanting supplemetary monstrousvisceralfat to the omentum/mesentery of recipient mice improves their insulin sensitivity (admittedly ns). I like this research group. They are reporting data and don't seem to have a specific point they are trying to prove. The down side is that I think their CLAMS equipment, core to understanding certain aspects, didn't work very well. You can tell they feel the same way by the turns of phrase they use to describe some of their utterly inexplicable peripheral data like RQs. I'll call it the Kahn paper. Kahn's group transplanted epididymal fat in to the mesentery and omentum of recipient mice, this drains to the liver directly. By their surgical technique some of this fat will have also had systemic drainage. They waited for 12 weeks. They then ran an hyperinsulinaemic euglycaemic clamp. 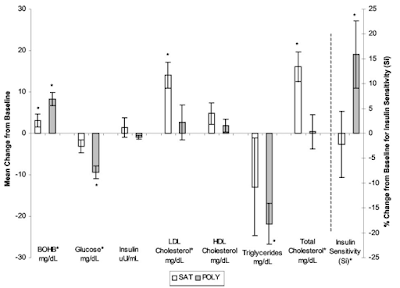 There was a modest (ns) improvement in insulin sensitivity. They checked the histology for macrophages, there were a few. They checked these for IL-6 production, it was minimal. 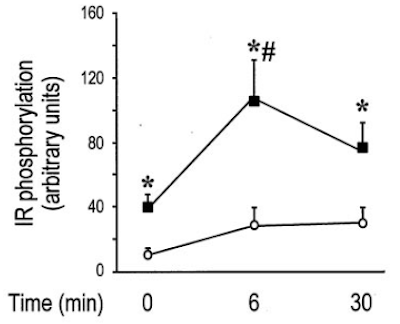 Happy fat, happy mice, no hepatic insulin resistance. Konrad's group also transplanted epididymal fat in to the mesentery of recipient mice. 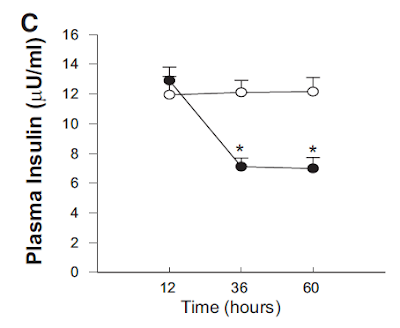 They waited for five weeks then did a clamp and showed marked hepatic insulin resistance. There was no increase in portal FFAs or liver triglycerides. They stained the fat for macrophages. There were loads. They checked for IL-6 production. There was loads. They did it all again but with IL-6 knockout mice. Minimal macrophages in the adipose tissue, obviously no IL-6, no insulin resistance in the liver. To Konrad it's cut and dried. Visceral adipocytes cause hepatic insulin resistance using IL-6. Kahn's group check for this and found nothing of the sort. What's going on? IL-6 is deeply involved in wound healing. Obviously IL-6 does cause insulin resistance, we know from Konrad's study. And we know that all of Konrad's implants were inflamed and secreting IL-6 at the end of the study, five weeks after the surgery. Was that because visceral adipocytes are just evil and want to kill us with IL-6 or is it because the healing process after transplantation uses IL-6 and is incomplete at five weeks? What if they had waited another whole seven weeks before testing at 12weeks? In Kahn's paper the beneficial effect of adipose transplantation showed best for SC fat placed in the mesentery/omentum. The benefits started to show in bodyweight and fat percentage at eight weeks and were more obvious at 12 weeks post op. The hyperinsulinaemic clamp at 12 weeks showed insulin sensitivity was improved, p less than 0.05 in this group. The visceral to mesenteric transplants were similar but not as marked, mostly p stayed above 0.05. Kahn's paper was 2008. Konrad's was 2011. Who to believe? Who might have read whom and worked out a counter study? Perhaps the matter has now been pretty well settled by the surgeons mentioned in the last post (Oregon excepted)? I think it is quite likely that over-distended adipocytes do produce IL-6. But you're not going to show this in normal mice eating normal chow. Clinical aside. If a case with pancreatitis, underlying an acute abdomen, ends up as an ex-lap, you get to see the state of the omentum and mesenteric fat under necrotising pancreatitis conditions. It's not pretty. In view of IL-6 and insulin resistance it should come as no surprise that acute pancreatitis is associated with diabetes, which resolves as the pancreatitis does, assuming a good outcome. Not always, but it's well recognised. I think IL-6 as a cause of hepatic insulin resistance is very real. I also think it is total artefact in Konrad's paper but, if it could be made to happen as a direct result of severe obesity (about which we have no idea from Konrad's paper), I might consider it to be a messenger. Looks like this hadn't happened in the morbidly obese folks going under the knife. I found a mini-review by that one group of successful omentectomy surgeons in Oregon, listing all of the omentectomy studies which have failed to improve insulin sensitivity (no explanation was offered), in which there is actually one very small study mentioned in which an omentectomy only was performed, removing just under a kilo of omental fat on average. That's a lot of omental fat in my book. Not only that, but the subjects were all obese and diabetic. I mean, visceral fat, hepatically drained, distended adipocytes, insulin resistance. How could an omentectomy fail? Spectacularly is the word and the authors say so point blank. I'd already decided I like these omentectomy-only surgeons before I found that three of them are part of Atkins Center of Excellence in Obesity Medicine. They might just share my biases! On phosphorylation of AKT in real, live humans. They're just like mice! "We show that visceral fat is characterized by higher expression levels of specific insulin signaling proteins and more pronounced and earlier activation of the insulin receptor, Akt, glycogen synthase kinase (GSK)-3, and ERK-1/2 in response to insulin". EDIT: Just look at those basal relative IR phosphorylation levels, visceral adipocytes have four times the insulin signaling as subcutaneous adipocytes after an overnight pre-surgical fast. I love this paper. END EDIT. I think that it is unarguable that visceral adipocytes are more insulin sensitive than subcutaneous adipocytes. First and 4th pairs of columns are SC adipose tissue, 2nd and 3rd are visceral. 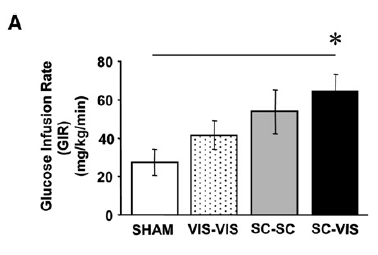 Even in obese subjects the glucose uptake by visceral fat, under clamp conditions, is higher than in SC adipose tissue. Lots of significant p values. In a normally fed Dutchman the fasting FFAs are around 0.2mmol/l at some time in the morning. This is the amount of FFAs being released under a plasma insulin of about 13.0microU/ml. At this level of insulin I very much doubt if any of these FFAs are coming from visceral adipocytes because insulin is still too high for this. This a workaday "ready for breakfast" sort of a combination of FFAs and insulin. I think it is very reasonable to consider that these FFAs are coming primarily from the subcutaneous adipose stores. By 36 hours of fasting insulin has dropped to around 7.0microU/ml and it stays there. At this level of insulin we have FFAs rising through 1.0mmol/l to 2.0mmol/l, that's very high. Insulin is now very low, low enough for visceral fat to release a lot of FFAs and the body is set up to run on fat and ketones. It could do with some hepatic insulin resistance to facilitate hepatic glucose output and the specifically portal vein draining fat depots (omental and mesenteric) are set up to do exactly this. Evolution has punished, by non survival, individuals who failed to follow this pattern. I think it is a pretty sound case that visceral fat does very little, other than hoover up a few calories, while ever insulin is above 12microU/ml. In the USA insulin probably never falls below this level. If you have to get up at 2am for a few bagels, doughnuts or a bucket of (low fat/high sugar) ice cream your body will forget what an insulin of 12microU/ml ever felt like. Visceral fat is a surrogate for chronic hyperinsulinaemia. It will be associated with metabolic syndrome because hyperinsulinaemia, not visceral fat, is metabolic syndrome. Given that nice, clear cut, pretty water tight case, what should a bariatric surgeon do about omental fat? 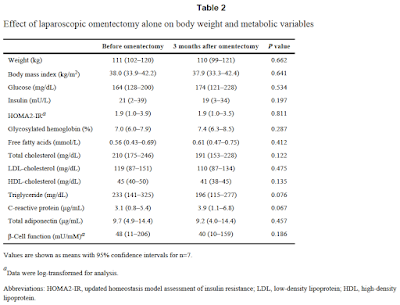 "Omentectomy does not have an ancillary short-term significant impact on the components of metabolic syndrome and does not induce important changes in the inflammatory mediators in patients undergoing LRYGB. Operative time is more prolonged when omentectomy is performed". "The theoretical advantages of omentectomy in regard to weight loss and obesity-related abnormalities are not confirmed in this prospective study. Furthermore, omentectomy does not induce important changes in the inflammatory status in patients undergoing SG". 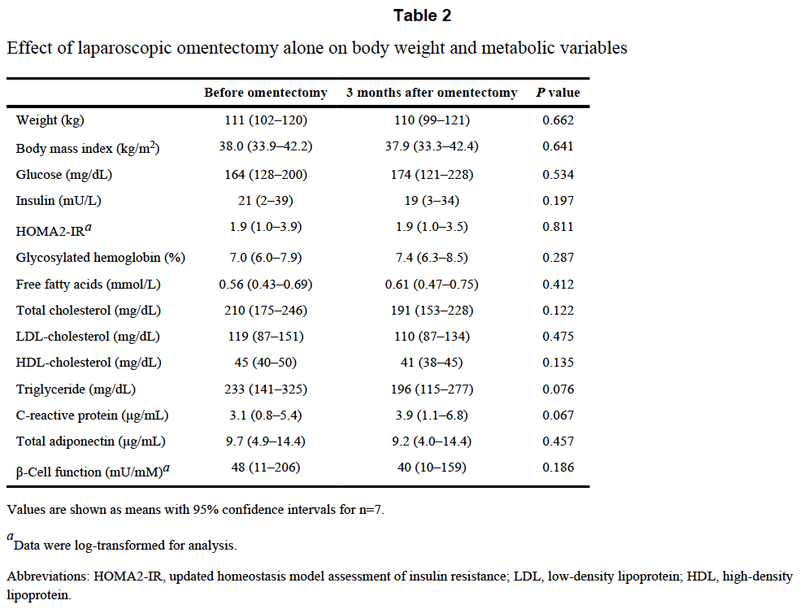 "Omentectomy added to a LRYGB results in favorable changes in glucose homeostasis, lipid levels, and adipokine profile at 90-days"
but the changes were small and didn't look particularly clinically significant to me. But then, I am very biased. Better hope this last group aren't effective medical politicos! Bottom line: Visceral fat does not cause metabolic syndrome. Association is not causation. Omentectomy is no panacea (no sniggering at the back there) unless you come from Oregon, with apologies to more sensible folks from Oregon. but I don't think I can do it. OK, here we go. Below are the same images as in the last post showing phosphorylation of AKT as a marker of insulin signalling. 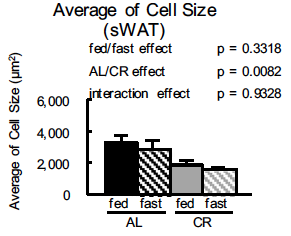 The fed CR mice have an insulin level of 1787.84pg/ml, pretty much the same as the fed AL mice (1549.76pg/ml). Let's look at subcutaneous adipocytes (sWAT) first. 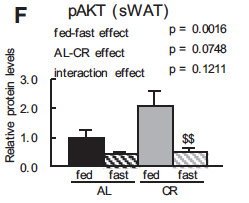 The fed level of plasma insulin is supporting twice the level of insulin signalling in the sWAT from a starving mouse as it is in an ad lib mouse. 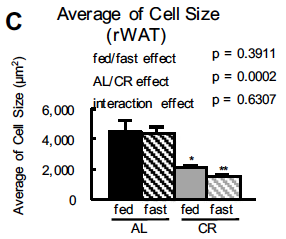 An adipocyte from a starving mouse is more insulin sensitive than one from a plump mouse. 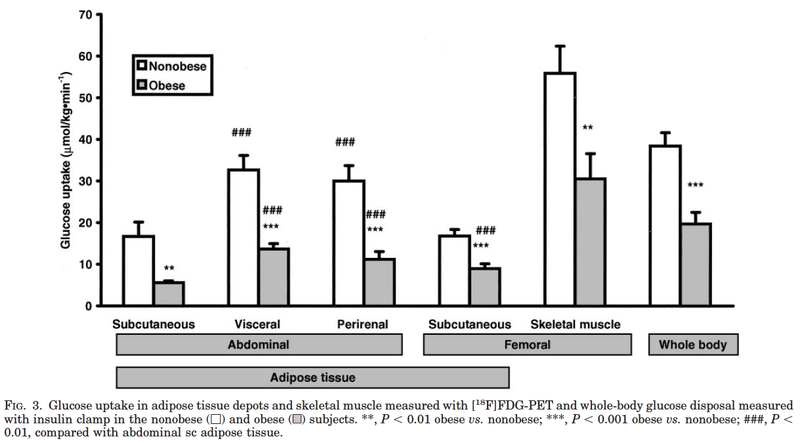 Not unexpected and clearly the adipocytes are small and desperate to have more fat. 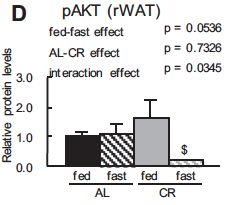 In the fasted state the plasma insulin is much lower in the CR mice (224.56pg/ml) vs fasting AL mice (477.25pg/ml) and this low insulin level supports the same degree of signalling in the fasted CR mice as the higher value in the plump but fasted mice. Again CR adipocytes are more insulin sensitive. But when we get down to the CR fasting insulin level of 224.56pg/ml we actually have significantly reduced insulin signalling in the visceral adipocytes of starving mice. A drop in insulin signalling is synonymous with increased lipolysis in adipocytes. Accessing visceral fat really does happen, but only at very low insulin levels. OK, I'll try to leave those poor starving mice alone now. We only need to look at the AL group. 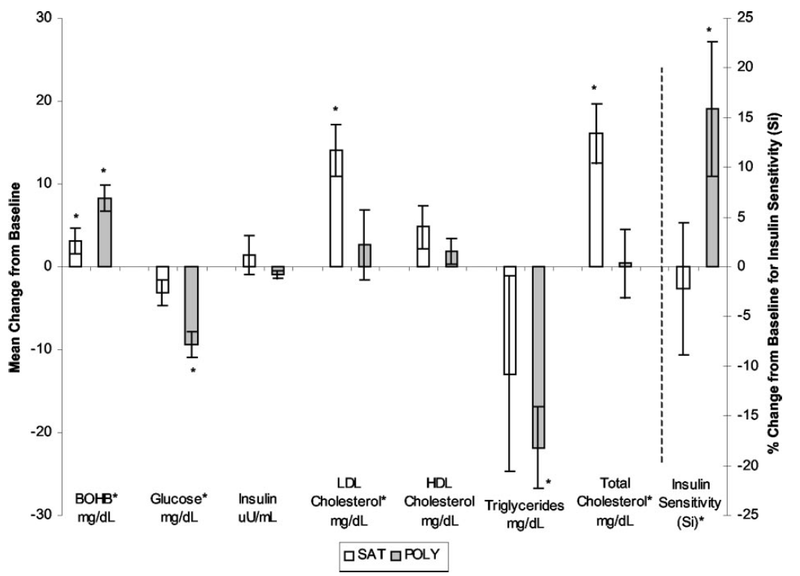 There is a fed insulin of 1549.76pg/ml supporting the reference level of insulin signalling. Next to it we have the fasted level of insulin signalling, somewhere around half reference value. This is being supported by a plasma insulin level of 477.25pg/ml. Simple. More insulin, more pAKT, more insulin signalling. 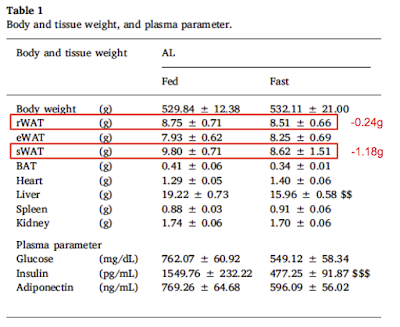 It seems reasonable to consider that the fed insulin level supports lipid storage in subcutaneous adipocytes and that half this level (fasting) might allow lipolysis. We can ignore the CR group. 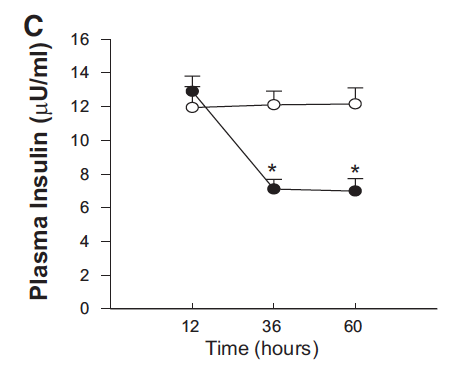 Here we have, again, the level of insulin signalling supported by a fed state plasma insulin of 1549.76pg/ml as reference and just look at the level of insulin signalling being supported by the fasting insulin level of 477.25pg/ml. It's no different to the fed level of signalling. Hmmmmm. 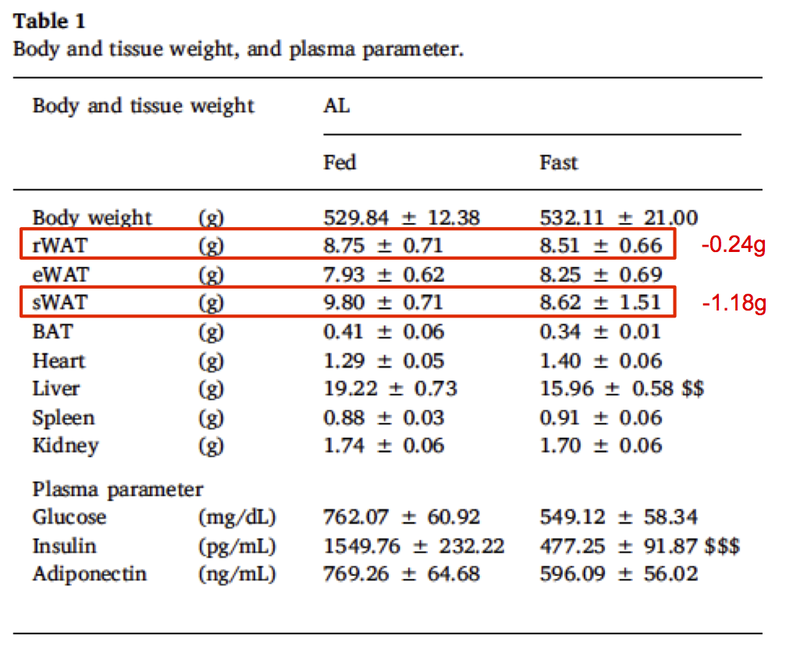 There we go, the tissue with the least fasting insulin signalling (sWAT) loses over four times as much lipid as the tissue where insulin signalling is maintained at the lower (fasting, 477.25pg/ml) insulin level (rWAT). What is it about the visceral adipocytes that programs this? Perhaps we should look at IGF-1 for the answer to that one. I think I worked through this several years ago but didn't have the tools to comment on it at the time. The recall I have is of reading what the high PUFA group ate. Fake bacon, soy nuts, vegetable oil. Lovely. BUT they ended up much more insulin sensitive than the saturated fat group did over 5 days. Higher ketones, lower glucose, lower trigs, higher insulin sensitivity. I had no explanation for this. Once you appreciate the Protons concept this is exactly what you would expect. There is continued insulin signalling when there should be physiological insulin resistance. While ever adipocyte size is kept low, via the ketogenic nature of the diet, enhanced insulin sensitivity should persist.